Give your dentures a quick rinse after every meal. 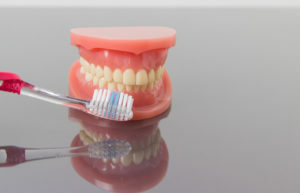 Brush your dentures at least once a day with a soft-bristled brush and a non-abrasive denture cleaner. Soak your dentures overnight. A denture-soaking solution helps to fight bacteria, and keeping your dentures moist helps them maintain their shape. Run a soft cloth over your gums after you remove your dentures. Use a mouth rinse to fight bacteria. Clean your tongue. You may use a tongue scraper for this or a regular toothbrush. Be sure to clean them over a folded towel or bowl of water; if you drop them, you want them to have a soft landing. Follow your dentist’s instructions for eating. You may need to avoid certain foods that could damage your dentures or eat in a particular manner. For example, cutting your food into small pieces makes eating easier for you and safer for your artificial teeth. If your dentures have metal attachments, be careful not to bend them. Your mouth will change shape over time, which will affect the way your dentures fit. Ill-fitting teeth can irritate your gums, and they may make it difficult for you to eat. Visiting your dentist for regular readjustments can extend the life of your dentures and help them stay comfortable for as long as possible. Eventually (after 5 – 8 years or so), though, your mouth will change so much that you’ll need new dentures altogether. Dentures offer a practical and functional solution to missing teeth, but only if you care for them well. Use the above tips to keep your new pearly whites and the rest of your smile in great shape. Dr. Gladston Silva is an accomplished general dentist in Daytona Beach who enjoys helping his patients regain their lost teeth and their confidence. If you have questions about dentures or other restorative treatments, contact our office at 386-274-2021.